Shrapnel from rockets flying over the Israeli port of Ashdod fell onto the outside decks of a German cruise ship at about 8:30 p.m. July 7. No injuries were reported, but AIDA Cruises has cancelled all calls to Ashdod through August. 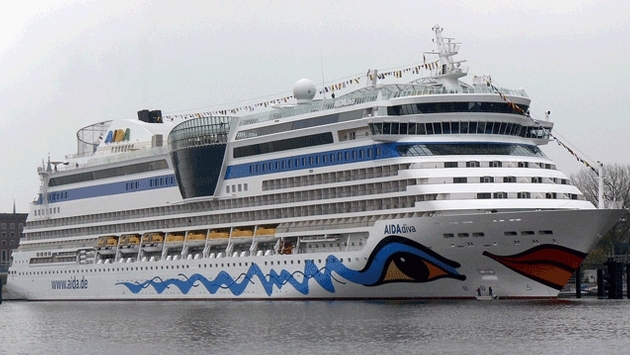 The AIDAdiva cruise ship sustained no damage, AIDA Cruises said, but passengers could see explosions in the distance. There were 2,700 passengers and crew members on the vessel. The ship’s officers kept passengers informed. Palestinians began firing rockets on Israeli towns from the Gaza Strip in violence that erupted after three Israeli youths were found dead, according to a Reuters article. Israel retaliated with missile fire on July 8. AIDA Cruises will substitute the Greek island of Santorini for Ashdod. The cruise line notes that no travel warnings had been in place for Ashdod, but the port was closed on July 8. AIDA said in a press statement that “small particles” that may have come from defense missiles were found on the open deck. “They do not constitute a danger. They were secured immediately by the crew,” the company said. The 69,203-ton AIDAdiva is on its way to Crete, where it is expected to arrive as scheduled at 8 a.m. July 9. AIDA Cruises is part of Carnival Corp.